Begin the day with a river cruise down the Chao Phraya River to explore the famous ‘khlongs’ (canals) (approximately 1 hour). Life along these canals seems a world away from the chaotic streets of the capital. 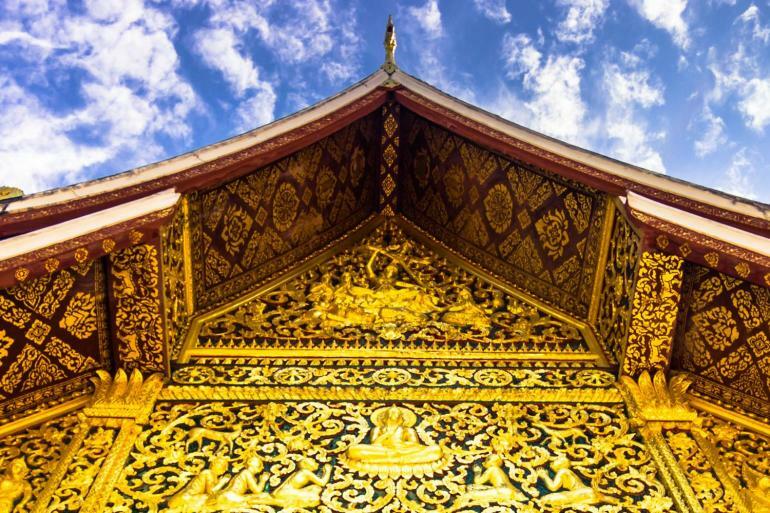 Pay a visit to Wat Pho, one of the ‘trinity’ of Bangkok temples, with a 46-metre long gold plated Buddha reclining inside. Even the feet of this statue are incredible, three metres long and intricately decorated with mother of pearl. The temple grounds are equally fascinating, filled with beautifully decorated stupas, halls, and shrines. This evening you’ll head north to Chiang Mai on an overnight train journey, accommodated in air-conditioned sleeping berths (approximately 13 hours). Multi share compartments are air-conditioned, with bunk beds; sheets and pillow provided. Your baggage travels in the carriage with you. There is a food and drink service available on board. Sometimes the air conditioning can make the carriage quite cold so you may want to bring a warm layer of clothing. The most vibrant city in northern Thailand, Chiang Mai has many famous temples and an interesting old city area. Renowned for dazzling beauty and extremely welcoming locals, the ‘Rose of the North’ will leave you spellbound. Chances are, you won’t want to leave. Embark on a scenic, winding drive up a mountain (around 45 minutes) to one of the country's most stunning temple complexes, Doi Suthep. A 300-step naga-guarded stairway leads you to the temples, and the climb is well worth the effort. The hypnotic atmosphere of chanting Buddhist monks and sweeping views of the city make this a most memorable experience. Today is free for you to explore, but there are also a few optional activities you can join if you want. Perhaps join a local cooking class today and discover the secrets of real Thai cuisine. You'll learn the key ingredients, how to use them, and what to use in their place if you can’t get them at home. As well as taking your own comprehensive recipe book with you after the class, you'll feast on the fruits of your labour for lunch. Get active with a bicycle tour to discover the city and surrounding countryside from a different perspective, or be spirited away on an early morning Chiang Mai tour that puts you at the epicentre of Buddhist rituals. Learn to meditate, offer alms to monks, and make an offering at a temple. In the evening you can choose to wander through the enormous, colourful Night Bazaar, and perhaps relax at a fine restaurant along the riverfront. Make sure to sample some delicious traditional northern Thai food – the signature dish is kao soy, yellow wheat noodles in a curry broth, traditionally served with chicken or beef. Take a journey through rural countryside to the Thai border town of Chiang Khong (approximately 5.5 hours). Formerly known as 'Juon', peaceful riverside Chiang Khong remains an important market town for the surrounding hill tribes and for trade with Laos. Stretch your legs with a stroll around town, and if you find youself with time, then Wat Phra Kaew and Wat Luang are both well worth a visit while you’re here. Then maybe enjoy a final Thai drink and dinner, while Laos beckons from across the mighty Mekong. Board a slow boat for the two-day journey down the mighty Mekong River to Luang Prabang. The journey is relaxed, so you can experience the slow pace of village life and the breathtaking scenery along the river up close. The river boat is basic in nature, with a toilet, covered roof, and open sides to take in the fresh air. There are seats in the front of the boat and a small open area in the back where you can have a nap on the mat, play cards, read or have lunch. Dock at the small town of Pak Beng (after about 6 hours) to spend the night. Hmong and tribal Thai people are frequently seen on the main street, where vendors sell local textiles and handicrafts. Reboard the boat and cruise to the Pak Ou Caves, before arriving in the former royal capital of Luang Prabang (approximately 7 hours). An important religious site overlooking the river at the junction of the Mekong and Ou Rivers, the revered Pak Ou Caves consist of two sacred limestone caverns filled with Buddha images of all styles and sizes, brought by devoted villagers over the centuries. The lower cave, known as Tham Ting, is entered from the river by a series of steps and can easily be seen in daylight. The higher cave, Tham Phum, is deeper and requires a torch for viewing. The atmospheric World Heritage-listed city of Luang Prabang is a favourite of many travellers. Nestled in the hills of northern Laos on the confluence of the Mekong and Khan rivers, the city is claimed to be ‘the best preserved city in South East Asia’ by UNESCO. The city and its people retain a refined, yet relaxed, air and it’s a wonderful place to wander the side streets and dusty lanes and seemingly step back into another era. Once the heart and soul of the ancient Lao Kingdom (Lan Xang) and designated a World Heritage site in 1995, Luang Prabang is endowed with a legacy of historic red-roofed temples and French-Indochinese architecture, not to mention some of the country's most refined cuisine, a multi-ethnic population and rich culture. Enjoy a guided tour around the Traditional Art & Ethnology Centre, a non-profit museum dedicated to the collection, preservation, and interpretation of its traditional arts and lifestyles. 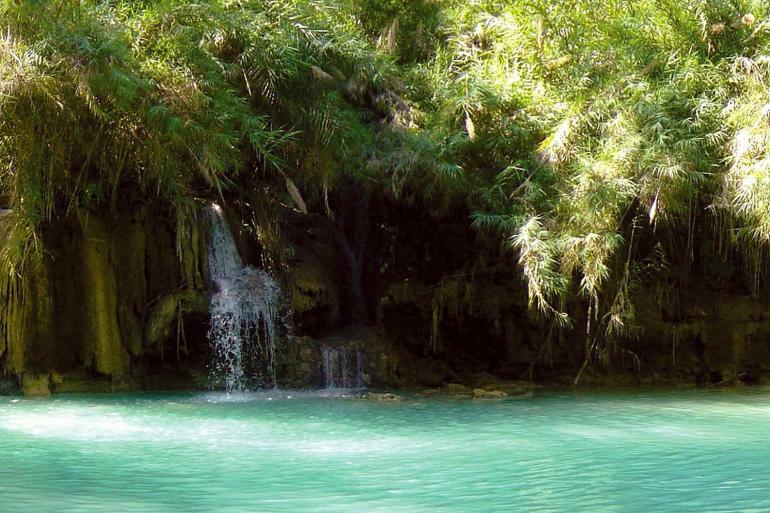 In the afternoon, head south of town to the beautiful Kuang Si Falls, a picturesque, multi-level cascade that offers fantastically blue pools that are perfect for a mid-afternoon dip. Back in Luang Prabang this evening you’ll have free time to make further discoveries, including walking around the popular night market. Today is free for your own explorations. It’s worth getting up in the misty early morning to view the procession of saffron-robed monks on their daily outing collecting alms, a practice that dates back centuries. The people of the town wait out the front of their houses with food for the monks to collect and take back to the temple. It is done early, as the monks cannot eat anything after midday. By giving food to a monk you ‘het bon’ or make merit, which should augur well for your next life. Make sure you don't miss Wat Xieng Thong, the most enchanting of Laos’ monasteries. Inside you'll find monks eager to practice their English with you. A large hill called Mt Phu Si dominates Luang Prabang's skyline, topped by a glittering golden stupa. You can climb the 328 zig-zag steps up to the sacred gilled stupa and big drum of the Phu Si Temple for a panoramic view of Luang Prabang and its surrounds. The Dara Market sells everything and is a great spot to browse. If you'd like to experience more local culture, consider taking a long boat across the river to a traditional Laotian village. There’s plenty to do in and around Vang Vieng, known as an adventure town thanks to its unique and varied surrounding country. The area is renowned for its many caves, many of which are easily accessible from the town. Perhaps the most famous is the cave of Tham Chang, a beautiful cavern fed by a natural spring making it a perfect spot for a refreshing swim. Hire bicycles to explore further afield, or if you’re looking to relax or perhaps learn more about local niche industry, you can visit an organic mulberry farm just outside town and enjoy a meal there. Continue by private mini bus to the country's capital, Vientiane (approximately 3.5 hours). Possibly Asia's most laidback capital, Vientiane is a city where daily affairs are conducted at a relaxed pace. Hardly touched by the modernisation that has completely changed the face of other cities in South-East Asia, it has a wealth of cultural delights to discover on foot, or for the less energetic, by jumbo (tuk tuk). Faded colonial mansions, tree-lined boulevards and old temples create an atmosphere of timelessness, particularly in the older part of town along the Mekong River. Pay a visit to Wat Si Saket, the oldest temple still standing in Vientiane and home to almost 7,000 Buddha images. Visit COPE, an organisation dedicated to assistance those who have been injured by the multitude of unexploded ordinance across the country. This is an excellent cause and a chance to educate yourself about Laos' devastating war history. This evening, maybe join your fellow travellers for a celebratory dinner as your adventure comes to an end. We fly from Vientiane to Hanoi (approx 1 hour) Please note you will be unaccompanied on this flight. In the arrivals hall of Hanoi Airport you will be met by an Intrepid representative, who will take you to your Hanoi hotel. The flight usually arrives into Hanoi in the late afternoon. As this is a combination trip, your group leader and the composition of your group may change at this location. There will be a group meeting to discuss the next stage of your itinerary and you're welcome to attend, as this is a great chance to meet your new fellow travellers. Travel by private minibus to the spectacular World Heritage site of Halong Bay in the Gulf of Tonkin (approximately four hours). The bay is dotted with sandy coves, grottoes and 1,600 limestone islands, which have been formed over millennia by wind and water erosion. Board a private boat and cruise the bay, exploring island caves and perhaps even enjoying a swim from Ti Top Island Beach during the warmer months. To end the day, spend a peaceful night aboard the boat beneath the night sky. Your wooden junk-style boat has twin share cabins with air-conditioning and private facilities. There's also a dining room and bar to enjoy lunch, dinner and breakfast. This morning head out on a day trip to explore the Mekong Delta. Board a boat to Ben Tre to visit the coconut gardens, stopping at a local home to sample tropical fruits & coconut jams. Afterwards, paddle in sampans (small rowing boats) past water coconut trees along the Mekong. Take a tuk-tuk tour around the villages, learning about local rural life and how they make their living making coconuts products like brooms and coconut fibre mats. Eat lunch at a restaurant in the heart of the Delta, sampling regional specialties such as the famous elephant ear fish. Then it’s back to the private boat to cruise the delta’s major waterways to Ben Tre boat pier. After the cruise return via bus to Ho Chi Minh City. Enjoy a final group dinner at KOTO restaurant, an organisation dedicated to developing the hospitality careers of disadvantaged youth. Guides All Intrepid group trips are accompanied by one of our group leaders. The aim of the group leader is to take the hassle out of your travels and to help you have the best trip possible. Intrepid endeavours to provide the services of an experienced leader however, due to the seasonality of travel, rare situations may arise where your leader is new to a particular region or training other group leaders. Your leader will provide information on the places you are travelling through, offer suggestions for things to do and see, recommend great local eating venues and introduce you to our local friends. While not being guides in the traditional sense you can expect them to have a broad general knowledge of the places visited on the trip, including historical, cultural, religious and social aspects. At Intrepid we aim to support local guides who have specialised knowledge of the regions we visit. If you were interested in delving deeper into the local culture at a specific site or location then your leader can recommend a local guide service in most of the main destinations of your trip. For trips departing on the following dates, use this finish point.